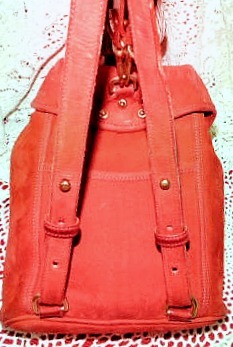 Size: H 9.25" L 8" W 3.75"
Condition: Very Good, NOT like new. Inside clean with a few small signs of use in bottom. No odd odors or damage. 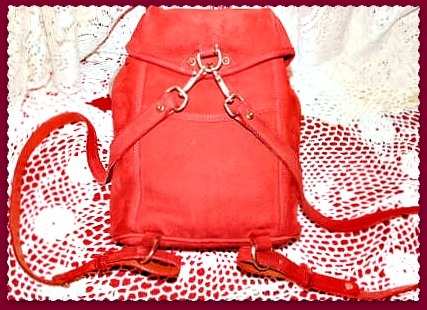 This beauty has seen a normal amount of use which shows primarily on the backside & shoulder straps. 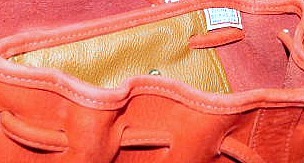 The leather is still just as strong, however as all suede-like materials do, the finish has worn smoother in contact areas such as the straps. 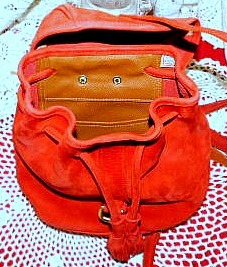 For this reason, our gorgeous Dooney Nubuck Back Pack is listed here in our Bargain Bags section of the store! No return and 100% authenticity guarantee or your money cheerfully refunded. 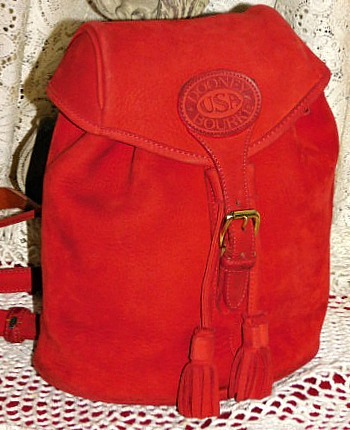 Jo's Note: "This striking cherry red Dooney Nubuck Leather Back Pack is one of 18 shades of color Dooney made Nubuck in back in 1995. You'll enjoy its secure closures and craftsmanship. It is clean with a few minimal signs of use. 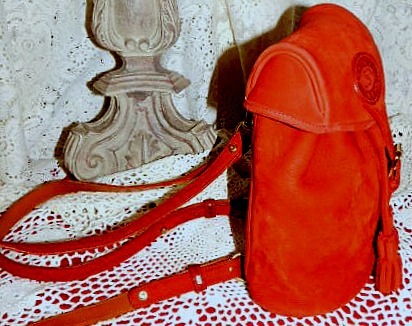 No damage or abuse just a great Bargain Bag!" 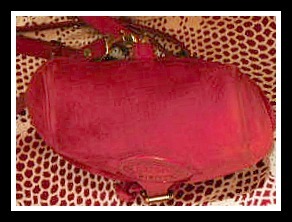 Required before purchase: Please read & learn what to expect of the Dooney & Bourke products you purchase from us and why Vintage Dooney Restoration is a full cut-above conventional restoration. 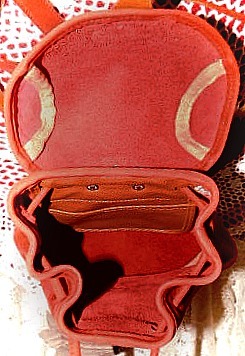 Complete inspection for damage, missing parts, marks, soiling, odors and wear is performed when receiving our Dooney's and again before listing them for sale and again before shipping them to you. Deep Cleaning with high end quality cleaning and restoration products obtained from all over the world and chosen for their superior performance and ingredients. Just as Dooney & Bourke chose to invest additional effort to design their Vintage Dooney line from leather hides they placed in huge oak drums filled with natural dyes derived from natures own bounty to produce rich lasting colors, we at Vintage Dooney have developed an incredibly effective exclusive restoration process. It may take more time, effort and expense than conventional restoration, but we believe it's well worth it to create a superior restoration. Environmentally friendly, chosen from the earth describes most of the fine restoration products used to bring you the Vintage Dooney you purchase with confidence here in our online store vintagedooney.com. 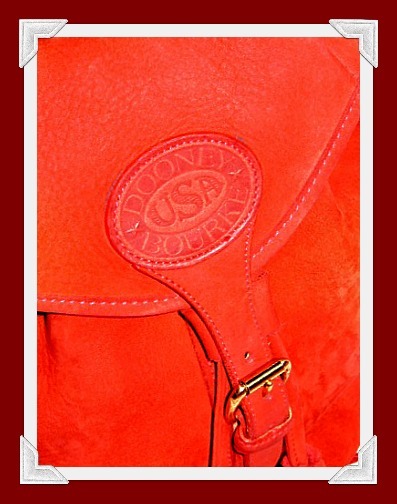 Authentic genuine Dooney & Bourke products: we have a money back authenticity guarantee on everything you purchase from us even on our sale and bargain items! All items in our store are previously owned unless we state they are brand new. Thus, you will expect some signs of prior use such as slight variations in coloring, minimal interior marks or soiling which cannot be removed. We will state the presence of any noteworthy wear or repair made and the price will reflect this. We are required to state Vintage Dooney is not in any way associated with Dooney & Bourke and we are not employees of Dooney & Bourke.